The city of Naples in Campania region of Italy is the original birth place of the pizza. In this recipe simplicity and quality of each ingredients is the most important. 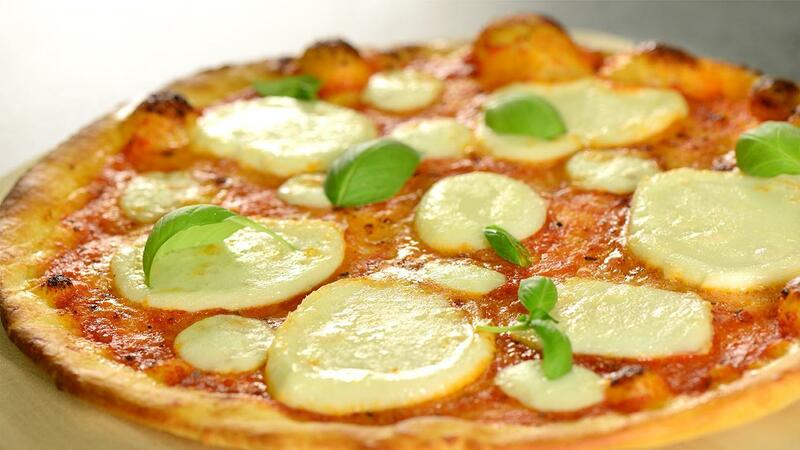 Knorr Tomato Pronto is the perfect base for pizza’s. Topped with Italian Buffalo Mozzarella and a little basil. Add the yeast and sugar to 650ml lukewarm water, mix together and leave for a few minutes, then pour into the well. Using a fork and a circular movement, slowly bring in the flour from the inner edge of the well and mix into the water. Continue to mix, bringing in all the flour – when the dough comes together and becomes too hard to mix with your fork, flour your hands and begin to pat it into a ball. Place the dough in a lightly greased bowl, cover with Clingfilm and leave in a warm place to prove for 45 minutes, or until doubled in size. Mix Pesto and Knorr Tomato Pronto together add some chopped fresh basil or parsley to the sauce. Note: Knorr Tomato Pronto does not need to be cooked, it’s already cooked with onion and olive oil then canned. Knorr Tomato Pronto can be blended or kept in concassè shape as a topping for your pizza’s. Flour each dough ball, then cover with cling film, and leave to rest for about 15 minutes – this will make them easier to roll it thinly. Dust a clean surface and the dough with a little flour or semolina, and roll it out into a rough circle, about ½cm thick. Spread the Knorr Tomato Pronto sauce over the base, spreading it out to the edges. Tear over the mozzarella and scatter with the remaining basil leaves. Drizzle with a tiny bit of olive oil and add a pinch of salt and pepper. If you can, cook the pizzas on a piece of granite in your conventional oven – if not, cook them one by one on pieces of tin foil directly on the bars of the oven shelf, towards the bottom of the oven (If you're going to cook your pizzas on the bars of the oven, make sure they're not too big – otherwise they'll be difficult to maneuver). Cook for 7 to 10 minutes, until the pizzas are golden and crispy.